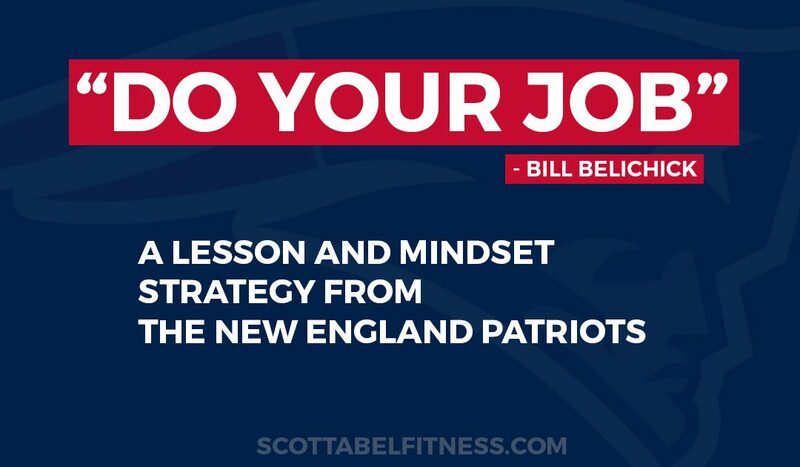 “Do Your Job” has been the NFL’s New England Patriots’ work mantra for years now. It came first from Coach Bill Belichick, though it has spread to the whole league and fans as well. It’s now the stuff of t-shirts and hats. “DO YOUR JOB” is a simple self-talk reminder of what it takes to achieve your goals. It’s just as relevant to the physique transformation game as it is to winning Superbowls. 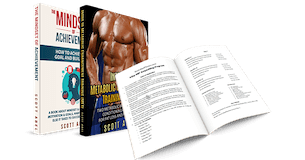 Are you serious about reaching your physique and weight-loss/leanness goals? Do your actions show that you are as serious as you say you are? Your mind can and will lie to you, but your actions and behavior will always tell you who you really are! Make no mistake, physique transformation is as much a mental game as it is a physical one. “Stinkin thinkin” won’t get you very far in terms of sustainable achievement, and far too many of you achieve your fitness or weight-loss goals but then you can’t sustain them. You helplessly watch the achievement slip away and then you end up right back where you started, seeking the next “magic answer” in whatever vogue trend is popular right now. But what if it is just your mindset that requires tweaking, and then the right behavior would follow? “Do Your Job” is something you can say to yourself and demand of yourself and remind yourself several times during the day to keep you on track in sticking with the process that takes you to your goal. I have used this Do Your Job mantra myself for years. When I wake up every morning at 4:00 am it’s the first thing I say to myself. I have also used this “Do Your Job” self-talk with my clients as well, and with great success. “Do Your Job” is a mindset mantra that sets your mind right when it comes to DOING what it takes to achieve your goals. When it comes to influencing the mind in a powerful way — mental fitness if you will — I prefer real, reality math over new age positive self-talk nonsense of “Yes I can” any day. Self-talk should be aimed at self-directed action, not warm and fuzzy feel-good nonsense. Too many people I talk to, or who email me, have foundations for their goals in a mindset of fear. Fear is the mindset equivalent of running in quicksand. It’s like having an ongoing affair with a very ugly lover. Eventually it will exhaust you just trying to get up to face the ugly. Trying hard not to fail is not the same mindset as trying hard to succeed. Fear of failure often produces the perfectionist mindset: Beneath your desire to succeed and achieve your goal is an ultra-critical, demanding, judgmental voice. This internal voice beats you up and beats you down, but it never lifts you up. It makes failure more likely, and it makes quitting more likely as well. Your mind rebels against the constant pressure and self-abuse. What real champions of applied excellence know is that there is a huge difference between constant self-assessment and constant self-judgment. Calling yourself vicious names because you cheated on a diet is not going to motivate you to accomplish your goal. Your mind will always rebel against being abused like this. It will seek ways to avoid it; not overcome it or disprove it. That kind of ‘stinkin thinkin’ doesn’t embolden and invigorate you; it weakens and cheapens your belief in yourself. The perfectionist mindset is much different than the excellence mindset. The excellence mindset is all about knowing you’ve given and are giving your best efforts. This includes discipline, commitment, and consistency. You show up and you “do your job.” . By contrast, the perfectionist mindset is about not making any mistakes. I’ll save you the time and energy and remind you: “you’re human.” Mistakes will come! Perfectionism is the mindset of obsession and the prison that obsession always brings with it. Excellence is the mindset of achievement, and the responsibility it brings with it. I’ll give you a real-world example here as well. Rookie Malcolm Butler was the hero of last year’s Superbowl who made the “immaculate interception” on the one-yard line with time running out and doom and gloom looming for the Patriots. He was reflectively and reactively “doing his job.” But here’s what you may not know. The week before the Superbowl the Patriots practiced their defense against that very same play. But in practice Malcolm Butler was beat for a touchdown on that play. The perfectionist mindset could have had him calling himself “a loser” and asking himself what he’s doing on the same playing field as these guys. He could have told himself getting beat on that play in practice is proof that he’s just not worthy. He could have though, “I hope they don’t run this play with me on the field in the Superbowl.” and on and on. But Malcolm had the excellence mindset. He also had the “Do Your Job” mantra drilled into his head. And without the self-judging, self-punishing perfectionist mentality he was able to clearly self-assess. He could handle being beaten on that play and assess what he did wrong, and how he may be able to correct it if he sees that play again. This is how the “Do Your Job” mindset works. It keeps you locked in to the task at hand, so you can learn to not only Do Your Job, but do it well, and do it better! Good thing young Malcolm Butler had that mindset of “Do Your Job,” too, because not only did he see that play again, but he saw it on his own one yard line in the Superbowl with 30 seconds left in the game, and the whole year on the line. But he wasn’t afraid to fail. He didn’t have time to overthink it. He “learned from practice” to do his job, and do it BETTER. Instead of a fear-based mindset about failing in your physique goals, your mindset should be one of excitement and anticipation of everything involved in the process of reaching your goal. The mindset of excitement and anticipation is like being married to a very beautiful woman or handsome man. This is the mindset of desire, and excitement and anticipation. The “Do Your Job” mantra just keeps it all real for you in your mind so you stop making excuses and using rationalizations for not doing the job it takes to achieve and sustain your goal. Can we improve on the “Do Your Job” mantra? I would also add your own name, so you keep it personal in your mind and in your agenda. If you want to achieve and sustain your physique or weight-loss goals, then “Do your job well, [NAME]” should be one of the first directives you give yourself each day when you wake up. When it comes to achieving your physique goals, doing your job means consistency, commitment, discipline and sacrifice. Remind yourself of to “Do your job well” when it’s Saturday night and you tell yourself that you are “forced to” go out for dinner and eat off your diet because you don’t want to make a fuss. Where is the commitment, discipline and sacrifice of “doing your job” in that scenario if you have lofty physique or weight-loss goals for yourself? You need to ask yourself in that scenario and those like it, is this honestly “doing your job,” or “doing your job well” when it comes to commitment, discipline and sacrifice required to reach your goals? Similarly, there are those of you who think that following your diet-strategy for a week or so means “I deserve a reward… a food reward.” Is this the kind of thinking that reflects “Do Your Job Well”? Abiding in expected actions and behaviors to achieve a goal, isn’t something that needs to be childishly rewarded. You do it because that is what it takes. Self-directives like “Do Your Job” and “Do Your Job Well” aren’t just buzz words for self-help books. These are measuring sticks you need to employ to keep yourself honest about your “true” commitment to your goals. Like “faith” and “hope” you can’t just employ commitment, discipline, sacrifice, and consistency and the “Do Your Job Well” refrain when it’s “convenient” for you to do it. It is more important to do it when it’s inconvenient. This is how great accomplishments are achieved. When it comes to the process of reaching your goal, you have to commit to that process unwaveringly. You have to “do your job, well”! That means showing up for work and practice with diligence and with your head on straight, whether you feel like it or not has nothing to do with it. Anything short of this isn’t a goal; it’s a fantasy! Self-talk reminders of “DO YOUR JOB” and “Do YOUR JOB WELL” will keep you mentally self-checking whether you are showing up and practicing the regular routines of consistency, commitment and sacrifice required of you to achieve your goal. I begin every day this way with this as the first self-directive I give myself. It sets my mind to being task-effective and not so goal-focused. And that is how you get there!